If you're buying a new TV and care more about picture quality than anything else, plasma is still definitely the best TV tech to go for. 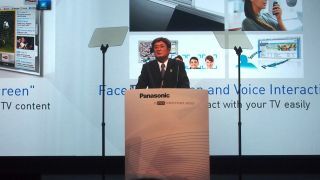 That's the view of Fabrice Estornel, the head of Panasonic's TV business in the UK. Panasonic has just launched a huge new range of both plasma and best-ever LED TVs, but the Japanese brand is still absolutely convinced that plasma offers the ultimate picture for both sports and movie fans. "Let's be clear," said Estornel in an exclusive interview with TechRadar. "Maybe we accept that the entry level on plasma is becoming more a niche market. But there are still lots of people who are really into picture quality and home cinema. "Many watch movies in ambient rooms. It's not like LED which is bright and more in your face, which a lot of people like. But with plasma it's a different kind of appreciation for the TV experience. So for sports and movie it's still the best technology." Unlike LCD TVs which use an array of LEDs to illuminate their pixels, plasma TVs use glass panels containing over two million tiny cells filled with a mixture of inert gases. An electric current passed through these cells excites the gases, causing them to illuminate the pixels across the screen. This method of lighting is traditionally a lot better for motion reproduction, contrast levels and reducing 3D crosstalk than LCD tech. But they do suffer from a lack of brightness and come with bulkier chassis than their LED cousins. Panasonic is now the only major brand producing full ranges of plasma TVs, and though the undisputed king of plasma (Pioneer) couldn't make the tech pay financially, Panasonic believes plasma is only now coming of age as a display technology. "To compare our new plasma TVs to the Pioneer Kuro is almost an unfair comparison, because there's been no development or new products from Pioneer in the last three, four or five years. It's no secret that a lot of engineers moved from Pioneer to Panasonic so we get something from this experience, but at that time the plasma market was in a different situation. "There was more volume and it was probably more difficult. But the good thing is we waited for the technology to be at an affordable price. So that's where we reach the right balance now, where you've got the best picture quality - better than the Kuro - at a price which is a lot more affordable." At an event attended by TechRadar in Nice, France this week, Panasonic has launched the European version of its bench-setting ZT60 plasma TV – dubbed "beyond reference" – and Estornel believes it's probably the best TV on the planet in terms of sheer picture quality. "It's clear when you look at a product like the ZT it's superior to what the latest generation gave and so it should be anyway. That's the way that technology goes, Kuro was a great product at that time, but now there's better on the market." At CES 2008, a year before it closed down its plasma operation, Pioneer showed off two stunning plasma prototypes. The first was an infinite black prototype; demoed in a pitch black room, the black levels were so flawless it was impossible to detect the edges of the display - the picture simply appeared to be hanging in mid air. "At this moment you can stop measuring contrast ratio - it's officially irrelevant," Pioneer said at the time. All the idling luminance was eliminated, which means the plasma cells had no afterglow once they were switched off. The second was an ultra thin 50-inch plasma that was just 9mm thick - "thinner than last month's issue of Wired magazine" - almost inconceivable back then, and still extraordinary today.